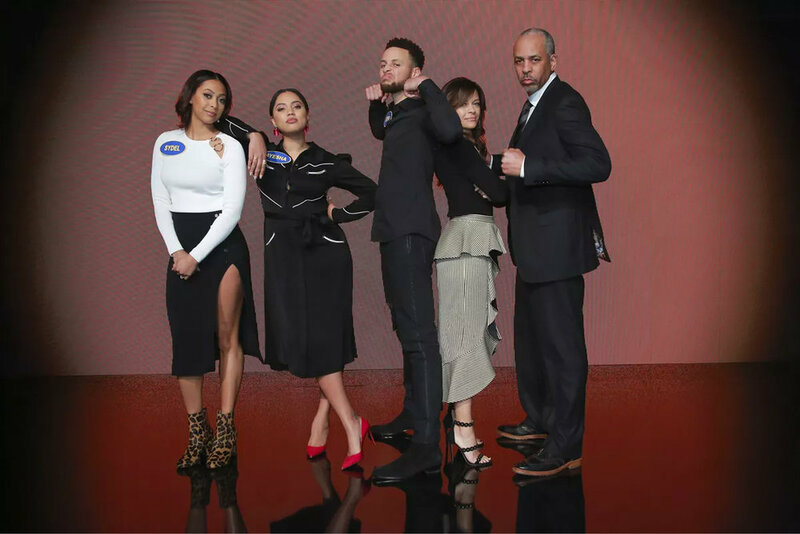 #StyledbyMGK - Sydel, Ayesha and Sonya Curry (in Cushnie et Ochs, Ellery, Alice + Olivia and Prada) with Stephen and Dell Curry on an episode of Family Feud, aired on June 24th, 2018. #StyledbyMGK - Kaityln Krieger (in Proenza Schouler) with husband and co-founder of Instagram Mike Krieger (in Dior Homme and Tom Ford) at the 2018 Met Gala. #StyledbyMGK (from left to right): Sonya Curry with husband Dell Curry (wearing Prada, L’Agence, Acne Studios, Stella McCartney and FRAME), Ayesha Curry (wearing Gucci), and sister Sydel Curry (wearing Moschino) seen at the 2018 NBA All-Star After Party in February 2018. #StyledbyMGK - Katherine Bardis with now husband Bay Miry featured in C Magazine, wearing a custom made-to-order Gucci reception gown from her “Full Bloom” wedding in September 2017. #StyledbyMGK - Producers Laurie and Charlotte Ubben of the Oscar-Nominated film “Loving Vincent”, wearing Prada and Gucci at the 2018 Oscar Awards. Ayesha Curry partnered with Cheeky kids and No Kid Hungry. For this event, MGK dressed Ms. Curry in Gucci. Cindy Frey, Taylor Frey, and other members of the Frey family attend the Kennedy Center Honors 2016. Glenn Frey of the Eagles was being honored.